I have been very busy during the past year and this was the reason for the few updates of this blog and my website. But the result was worth it. 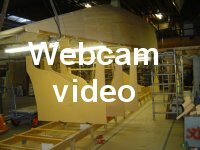 During Easter I cleared the workshop and moved the boat ………………………. See the latest update of the Fairing and Painting Photo Gallery. It’s been a long time since we hung the first float under the roof, followed by the second one. All those years they have collected only dust but now they can come down again. The port float is hanging above and behind the boat. To bring down the port float I first had to make room next to the boat. The boat has to slide sideways to create ample maneuver space for the forklift. With the help of two pallet jacks the boat easily slides sideways. With a makeshift boat-stand clamped to the forklift I carefully lifted the float, unscrewed the tensioning straps the floats were hanging in and bring it down. However, maneuvering with forklift and boat only takes one way. The port float is still looking in the wrong direction but turning is not possible because of lacking space. The workshop crane brings the solution. In the free space somewhere in the middle of the workshop height, I can turn the boat in the right direction and bring it back to the position at the port side of the center hull. The other float is much easier to reach and is already hanging in the right direction. There is still not enough maneuvering space for the forklift but taking it over by the workshop crane brings the float to its position at the starboard side of the center hull. After all the dust has been removed, the first work is putting the floats upside down for applying the Coppercoat anti-foul. You are currently browsing the archives for the Boatbuilding category.